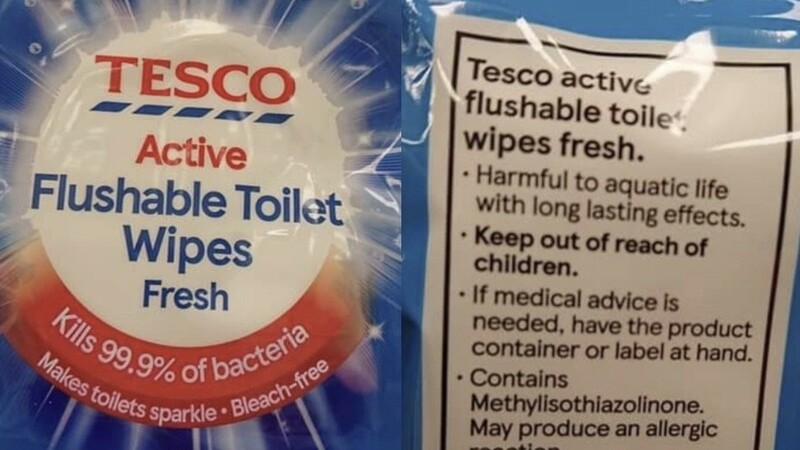 Supermarket giant, Tesco, has denied that its new flushable wipes are harmful to aquatic life after the packaging seemingly states otherwise. The supermarket's own brand product reads: "Harmful to aquatic life with long lasting effects," causing backlash from social media. Twitter user, Harry Medawar, posted a picture of the products, captioned: "FFS, only Tesco could dream up flushable toilet wipes that are harmful to aquatic life with long lasting effects #boycottTesco. Michael Gove Please call them in and get it off the shelves." While conservation organization Camden Greenpeace, tweeted: "Dear Tesco, can we ask why you are selling flushable wet wipes that not only kill 99.9% of bacteria but are also potentially lethal to aquatic life? "This stuff is being flushed down the toilet, so these chemicals are entering our rivers and the seas. This is plain wrong." Responding to the charity, Tesco said: "The wipes aren't harmful to aquatic life after they have been flushed but we do understand how this looks a bit confusing so we’re working with our supplier to change the ingredients so the warning is no longer required." The Marine Conservation Society has urged people to not flush wipes down the toilet, as they're a contributing factor to the 366,000 sewer blockages in the UK every year. According to The Telegraph, the organization said: "When flushed, wet wipes don't disintegrate like toilet paper and they typically contain plastic. Once in our seas, this plastic forms part of the greater problem of microplastics at sea. This microplastic, once in the oceans, is eaten by zooplankton, which forms the base of the food chain; they are eaten by the fish we eat."